Healthcare organizations require comprehensive information management to ensure that vital patient information is always available to caregivers at point-of-care. A well-designed patient care system can streamline workflow, reduce the risk of medical errors and improve the patient care experience for caregivers and patients alike. With Quintegra’s patient care framework, healthcare providers are quickly streamlining patient care processes to realize greater control, increased productivity and improved accuracy within their departments, throughout their facilities and across the enterprise. The Healthcare Practice at Quintegra provides smart and innovative solutions to several leading healthcare organizations around the world. The Healthcare Practice provides a revolutionary patient care framework for effective and efficient management of the patient care process. With Quintegra’s patient care framework, staffs can dedicate more time to patient care information and enhance patient safety. Quintegra’s patient care framework is an electronic system offering care providers interdisciplinary plans of care required for a patient-focused care delivery system. Automated work-lists allow care providers to document care using a point-of-care-device. The framework provides the ability to observe up-to-date patient information, while managing all the constituents related to a patient. 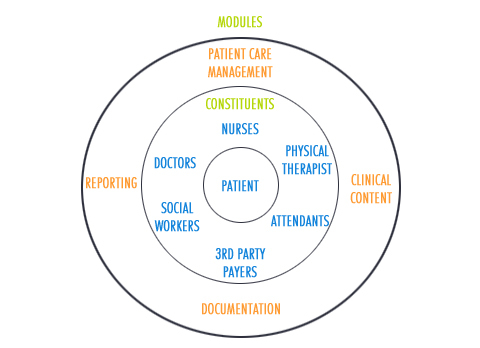 The patient care framework establishes and generates the clinical tools needed to manage the delivery of patient care. Combined with Quintegra’s hospital management solution, the patient care framework covers functional areas such as diagnosis, review details, inpatient & outpatient management, doctors' appointment diary, prescriptions, operation theatre management and the like. The system provides for extensive MIS reports and the data can be used for research and analysis. Create a patient assignment and identification lists. A care provider assignment list displays a particular care provider's patients. Initiate a patient standard of care for delivery of protocol or location specific patient care. Generate a suggestion list of problems from assessments. This list can be included on a patient's plan of care. Establish a plan of care for an individual patient. This can be a care plan or a critical path for the generation of work-lists and assessments. To facilitate the transition of automating patient care planning and on-line documentation, standard care plans are bundled. Customized care plans can also be developed for the framework. The documentation facility provides extensive customization capabilities, graphing upon demand, real-time data entry & publishing, various indicators and archiving. Patient profiles, including data screens, orders, current medications, interventions, notes, and data histories. Up-to-date plans of care, care provider work-lists, and patient care summaries and output formats capturing documentation data. Variance reports from critical pathways, tracking individual patient variance information and cross patient statistical data. Audit reports listing documented patient care. Patient data is presented in a logical and concise format through standard screens and panels for clinical decision making. Point-of-care documentation reduces transcription time and inaccuracies. Point-of-care documentation allows users to view real-time recording of patient data in the framework for timely decision making. Data can be viewed during documentation process to view patient's progress. Plan of care work-lists and assessments are automatically generated for a specific care provider discipline, which allows care providers to easily facilitate day-to-day patient care management.